The woven daisy style that is pictured below can be woven for you in the size and colors of your choice. Tina always has some woven flowers available for immediate sale. 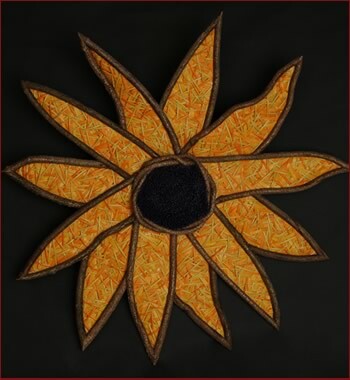 Please contact Tina directly to make a purchase or commission a custom-woven daisy. H 60" W 60" D 4"
The petals of this large, richly textured, daisy are woven, layer upon layer, in different shades of yellow and orange. Tina's dimensional style of weaving produces layers of different colors strategically placed like a painter lays down paints of different colors to create texture in a painting. Wild Daisy's center is a deep purple woven with round reeds. Framed out of bittersweet vine and then woven with flat reeds. View enlargement of construction detail .